Beginning in 2013, Volvo has a new OBD2 Style diagnostic connector for a Volvo chassis with a Volvo engine. This adapter allows the use of a standard J1939 tester to connect to the new connector style. The GMC Top Kick with the Cummins engine uses an OBD2 style connector for diagnostics, but uses J1708 data. The Top Kick with the CAT engine uses J1939 Data. This adapter allows a J1939/J1708 tester with the standard J1939 9-pin connecter to hook to the Top Kick. 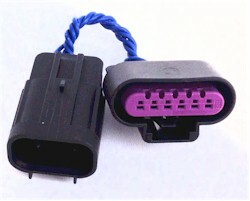 This adapter allows a J1939 tester with the standard J1939 9-pin connecter to hook to the Hino with the OBD2 style connector. Allison (and some Detroit Diesel) vehicles using the 16-pin OBD2 style diagnostic connector use pin 4 for Ground instead of pin 5. This adapter allows a standard J1939 accessory (GPS unit, tester, etc) using the 9-pin plug to connect to the Allison diagnostic port. GM Adapter for ALDL testing. The Polaris Slingshot uses an 8 pin diagnostic connector instead of the standard 6 pin flat connector.